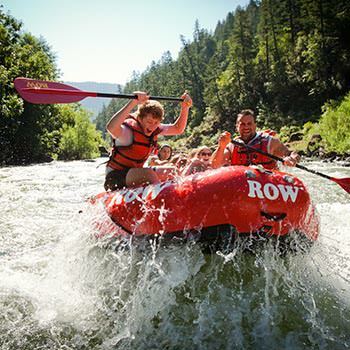 The Rogue River offers the opportunity to paddle your own inflatable kayak, enjoy the excitement of a paddle raft, or ride aboard a comfortable oar rig piloted by your skilled guides. Oar-Rigs are 16', self-bailing rafts piloted by your guide, and therefore less "participatory" than other boats. All you have to do is hang on! Inflatable Kayaks are exciting, every time! Follow the other boats through each rapid. Steering and propulsion all depend on you with an inflatable kayak! These rafts are 11 - 13' long and carry one or two people.